Hello, #friendsofTenaciousM!! Happy last Sunday of January. Have an amazing week! This Candy Bar Stash Chocolate Cake starts with a rich chocolate cake with a tender, moist crumb and is topped with a sweet chocolate buttercream made with butter, cocoa powder and cream. If that isn’t enough, take it up a notch and add your favorite chocolate candy bars. Once the cake is frosted, top it with a variety of candy bars making sure to do it right away as the frosting acts like a glue once it sits. It’s fun to give dimension to the cake by using Kit Kat, Crunch Bars, or even full-size candy bars that stand up on the cake. Top with your favorite chocolate candy bars — Kit Kat, Crunch Bar, Snickers, Reeses Peanut Butter Cups, Twix, Milky Way, Butterfinger, and M & M’s. This is one baked good that gets even better the next day, if covered. You’ll hardly be able to bake these little gems before they’re devoured! Enjoy! Prepare Cakes: Preheat oven to 325°. Beat 1 1/2 cups butter in a medium bowl at medium-high speed with an electric mixer until smooth. Gradually add granulated sugar, beating until light and fluffy. Add flour mixture to egg mixture alternately with buttermilk mixture, beginning and ending with flour mixture. Beat at low speed after each addition. Fold in bittersweet chocolate morsels. 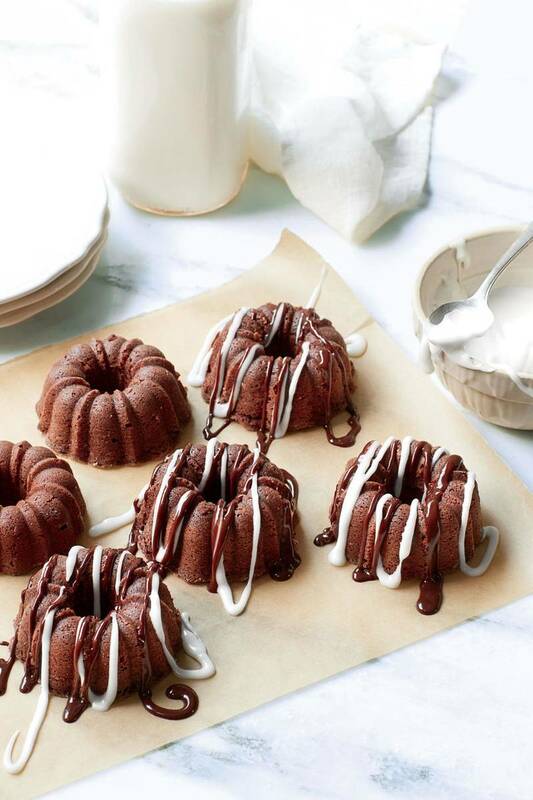 Pour batter into 2 lightly greased (with vegetable cooking spray) 12-cup Bundt brownie pans, filling each about three-fourths full. Bake at 325° for 26 to 30 minutes. Cool in pans on wire racks 10 minutes; remove from pans, and cool completely. Prepare Buttermilk Glaze: Whisk together powdered sugar, 1 Tbsp. buttermilk, and 1/4 tsp. vanilla in a small bowl until smooth. Add up to 1 Tbsp. buttermilk, if desired. Drizzle warm glazes over cooled cakes. Happy Sunday!! Wishing you amazing week ahead!